Go here for our 2013 Gratitude Challenge! 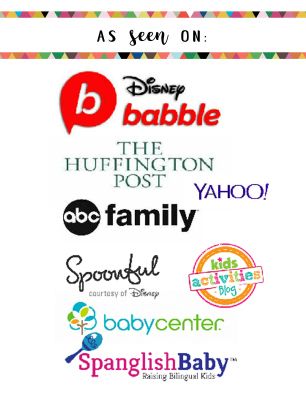 There are over 21 bloggers who have joined forces because we believe that gratitude can be contagious and we desire to spend this month being grateful with our families. Each day a different blogger will walk along side of you in this challenge and share their experience. 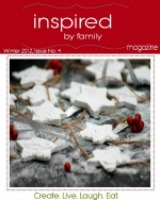 Stop by and visit their website on the date listed below to read their Contagious Gratitude story or activity. My hope is that you will find beauty and blessings in the mundane, in the beautiful, in the ugly as you: change diapers, wash dishes, sit in holiday traffic, stir the pot of soup, look into your spouses eyes, hold your child in your arms… We are constantly surrounded by small miracles let’s open our eyes and embrace them. May the Lord open the eyes of my heart so I can see them! 1. Let others know about our 21 Days of Gratitude Challenge for the Whole Family and use the hashtag #21DaysGratitude. Our hope is that it’s contagious and 1000′s of families join in so help us get the word out. In the midst of our busyness it’s easy to forget to pause and be thankful. Sometimes we are in the midst of difficult circumstances and we struggle with being thankful and that’s when we need thanksgiving to intervene. If you enjoy our post, feel free to follow us on Twitter, Pinterest or Facebook and our readers preferred way via email. This is the schedule of the 30 fabulous bloggers participating in the 21 Days of Gratitude Challenge. 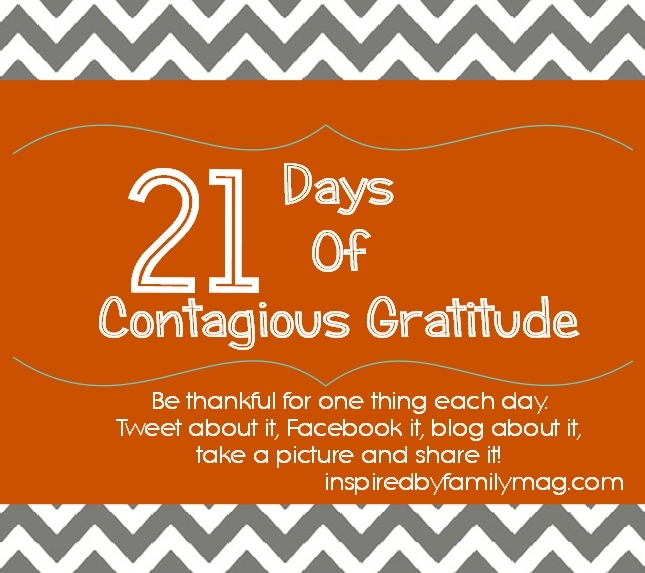 Come back and let us know you’re participating either leave a comment or link up your post from your blog or a picture via FB in our 21 Days of CONTAGIOUS Gratitude! Grab the button if you would like to add it to your sidebar or to your post to help get the word out. Angelique, I am so glad you are joining in the fun! Count me in!! Just shared your photo on Facebook. Lou Ann, Yay! Glad to have you participate. Thanks for the shout out! This is awesome. I would love for you to link the challenge up at my November Family Challenge. It will be live on November 5th at True Aim. This is confirmation for what I’m doing in my Sunday school class. I challenged them to create a gratitude journal for the month of November. Each day they have to write 5 things they are grateful for. It has to be something positive and they can only list it once. I’ve also decided to start doing some form of voluneeter project each month with my boys. I can’t wait to get started. So very awesome, isn’t it cool when things work out like that. Blessing on your journey of thankfulness and service outreach with your families! Deb, It’s my pleasure, by the way I love the list! So excited to join in!! Thanks for organizing such a great challenge! I am going to join in. . . another opportunity to think about thankfulness. . . Awesome! So excited to join this!! Such a great time of year to remember our blessings! Thank you!!! Thank you for this! I think I am going to make a tree with brown paper grocery bags. Each day, we will pick something we are thankful for and write it on a leaf to add to the tree. It will be a visual reminder to be thankful. Thank you for the prompt to keep me prayerfully thankful! OK… So I posted a notification on my blog and will be posting our gratitude starting today…. I’m joining in! My daughter is still very young so I will just do it myself. Being thankful is so important. This is just what I need right now. I’ve decided to join in via my facebook page. Each day I’m writing a paragraph as to what I’m grateful for and linking to this post. Thanks again. Hi Mari, thanks for inviting us to the challenge. It’s only been the first day, but our family has loved doing it and been uplifted by it. We can’t wait to share our daily journey. I am thankful to be included! Thank you again for organising this fabulous initiative. Can’t wait to be part of it! Mari thank you so much for creating this movement. It has been so inspiring to read through everyone’s posts and I’m so excited to be taking part. 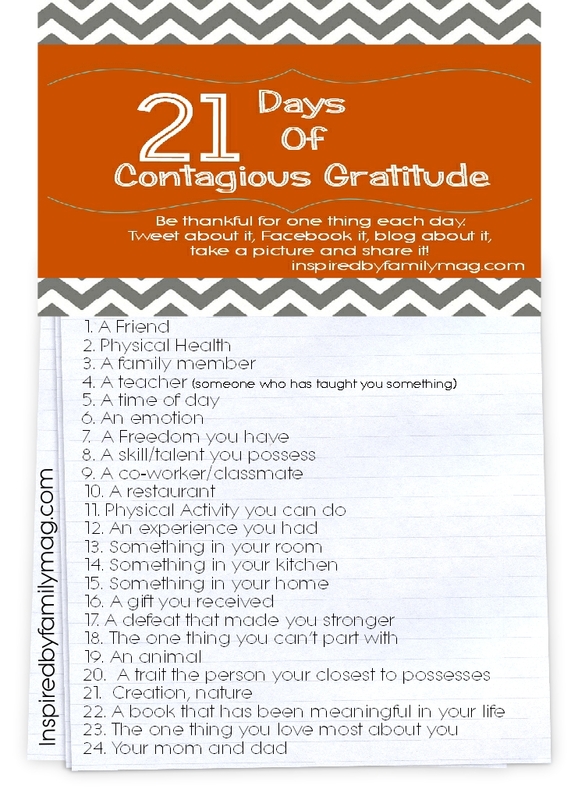 Is there 24 items on the 21 days of gratitude list? Ha, ha, yes there is. It was done for those who joined in late or for those who wanted to keep going. Enjoy your Thanksgiving week.